It had been a few weeks that I hadn’t been propelled by the wind. I’ve been walking, biking, taking public transport. I’ve been swimming and floating, catching rides and waves, skipping and even jumping from places that maybe were a little too high. But I needed to make the wind move me. I haven’t always been a sailor, but I am now. My first time on a sailboat was college, when my best friend’s father took us out on the Long Island Sound. I grew up in a landlocked state, but I was always a waterbaby. Life with time made me more comfortable with diving in head-first and deep. 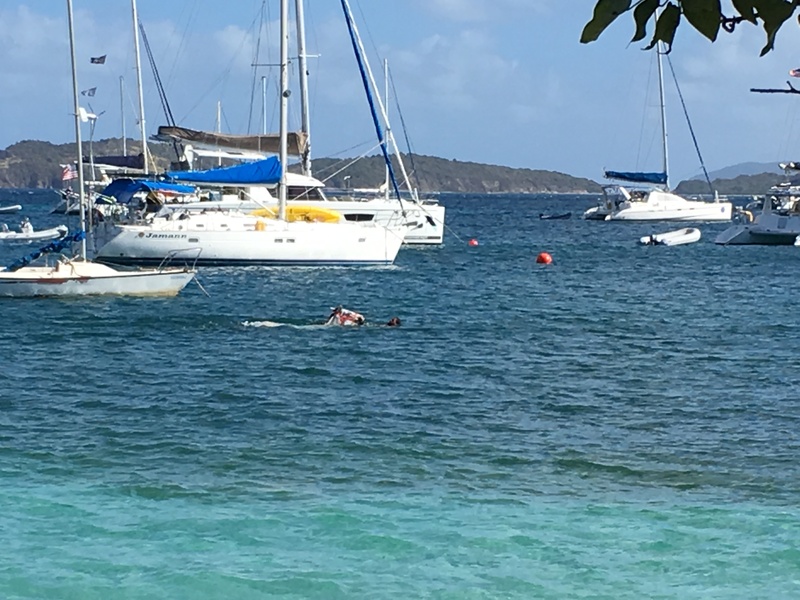 The view steps from my apartment – yes, that is a man swimming with a horse past sailboats. that overlooks a mooring field in the tropics. It pained me to leave the boat, because I am completely (head over heels) in love with the idea of having such freedom as to move to different countries and ports whenever the winds are right. For a while, the winds were simply not blowing in my favor. Now they are. 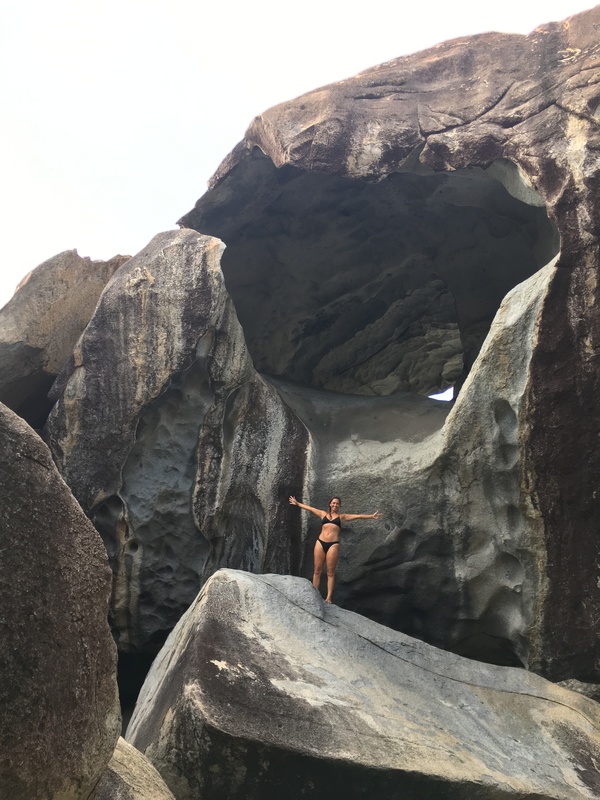 Last week, I was blessed with a generous and caring friend who invited me out on his catamaran to sail the British Virgin Islands. Although I live so close to this magical little archipelago, I had yet to visit. But beyond just experiencing new places and people, I yearned to feel the wind whipping through my long hair, sun on my face, the sea spray on my skin. YES! Spinnaker up and we’re cruising. how to hoist this asymmetrical sail, which pulls a vessel through the water with winds from the stern, rather than cut across the wind’s angle. Attaching it to a halyard, we lifted the chute of the sail to the top of the mast and then opened it up to unveil the perfect tool to let the wind move us. Who needs a motor when nature is there to help? I think this is why I love sailing so. It reminds me to literally go with the flow, that life can be easy when you let it. For the years I was sailing from the states through the northern reaches of the Caribbean, it was a battle. We were constantly going the wrong direction, struggling to get to a location where we could drop our anchor and take a break. But it felt like the break never came. It was always an anxious search for a place to shelter from potential storms or grasping for a place where my captain could make money. We were creating challenges where abundance and peace should be. It was moving against the wind. Such is life, yes … it can’t always be easy. But in order to find happiness, we must look for the easy. How is life encouraging us to flow? Where are the winds to our back? This does not mean living within the comfort zone – quite the opposite! It means searching for the signs that present themselves for us to naturally progress. The sail through the BVIs normally happened in the opposite direction for my friend, but we changed plans and sailed around the chain of islands “backward.” And guess what? It was perfect. been challenging for me. I spent a lot of time confronting myself and my limits, unveiling who I am from the thick veneer of ego that was built by years of letting the winds bypass me. Salt air has a way of breaking things down. When I look back on my life, there have been many times when I thrust myself into uncomfortable, challenging situations in a desperate and necessary attempt to grow. And every time, eventually, I found my wind. Lately, I’ve been noticing the more I grasp for something, the less I get. The more I accept the world as it is – acknowledge the way the wind blows and put up the right sail – the simpler and easier life is. 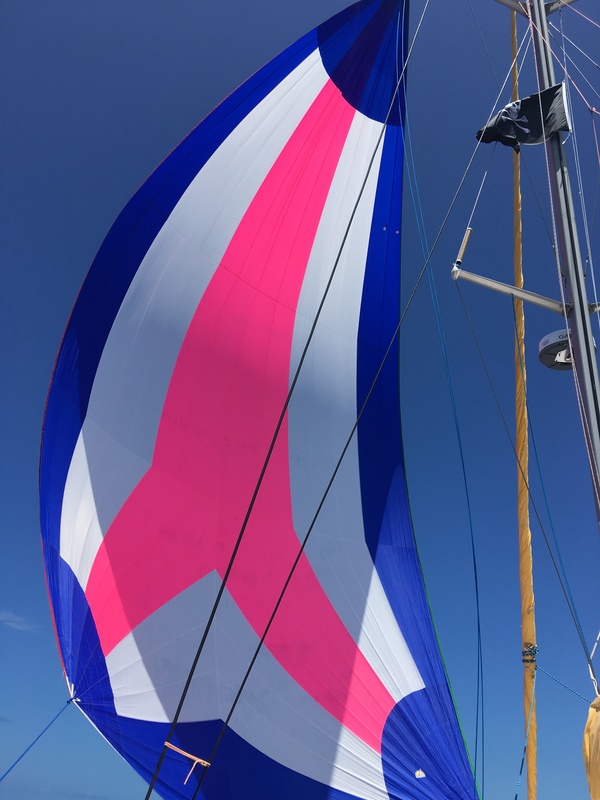 Last week in the BVIs, we were one of a very few vessels that even had a spinnaker sail. You have to own and develop the right tools in your life to catch the right wind. Where do the right winds blow me? I seek to get to a place where I have no worries, where I am constantly surrounded by love, propelled naturally to my next, new adventure filled with miracles. Dozens of people around me have been embracing big changes, with new jobs, relationships and experiences. It’s beautiful, and it makes me wonder what the winds have in store for me. If we stay true to who we honestly are and fully accept the winds of life, we are all in the perfect place for our special breeze to propel us. All we have to do is set the sails.